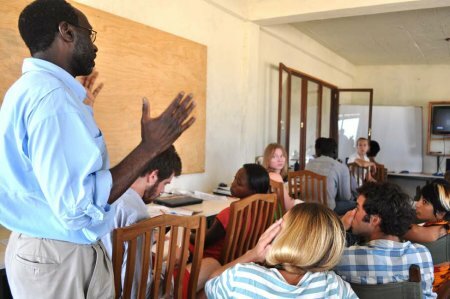 The last course at the Turkana Basin Institute’s Field School is Paleontology, the study of animal evolution through fossil remains, taught by Professors William Anyonge and Fredrick Kyalo Manthi. 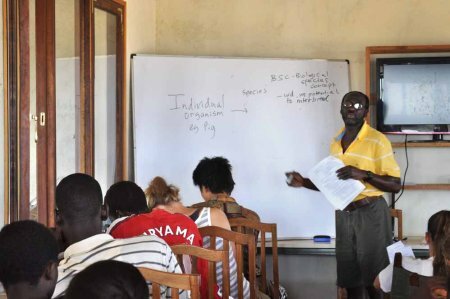 The course began last week as Dr. Anyonge, of Xavier University in Cincinnati, began lectures and lab exercises on taphonomy, vertebrate morphology and evolution. 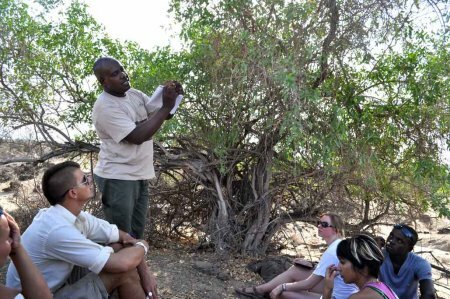 Dr. Manthi, who heads the Kenya National Museum’s division of Paleontology, has lectured on micromammal assemblages and led exercises in the field. Both lecturers have been joined by Dr. Meave Leakey, whose expertise on the paleontology of the Turkana Basin has proved invaluable for students in the course. 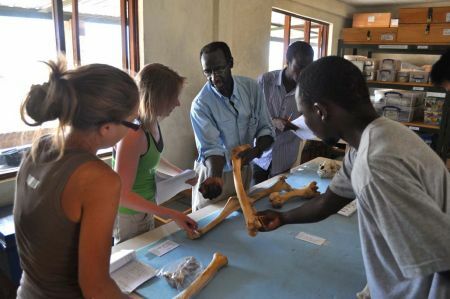 Dr. William Anyonge shows students the bones of a camel in TBI's classroom laboratory. Dr. William Anyonge lectures students on dental evolution among vertebrates. Dr. William Anyonge is a professor of Paleontology at Xavier University in Cincinnati, but is a native of Kenya and worked for many years in the Kenyan Museum of Natural History. He began his lectures by reviewing comparative vertebrate skeletal and dental anatomy, and helping students understand processes of fossilization. Patrick, Priscilla and Wyatt examine a series of long bones laid out in the TBI lab. Laboratory exercises allow students to interact with modern and fossil remains that are discussed in lecture. Most of the materials made available for study are prepared by TBI paleontological or zoological staff, such as Timothy Ngundo and Harrison Ngumbau, who manage collections. Alisha, Kasia, Luke and Johnpius listen as Dr. Anyonge shows how forearm morphology differs among ungulates and primates. Dr. Anyonge lectures on species concepts in biology. Dr. Fredrick Manthi lectures students in the field outside TBI camp. Dr. Fredrick Kyalo Manthi is the head of Paleontology at the Kenya National Museums, and an expert on micromammal assemblages. While most of us are familiar with the famous fossil remains of our ancestors like Lucy, or of large sabertooth cats or mammoths, few realize that the remains of small animals including rodents and bats are also critical for paleontological research. Groups of fossil remains from small mammals found in discrete areas, called assemblages, can help researchers precisely identify locally varying niches which were present on a landscape millions of years ago. 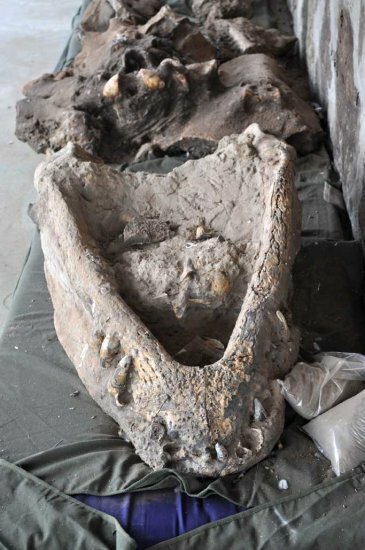 A tremendous fossil crocodilian from the east side of Lake Turkana, found in the famous Koobi Fora formation and housed for now at TBI's Ileret facility. 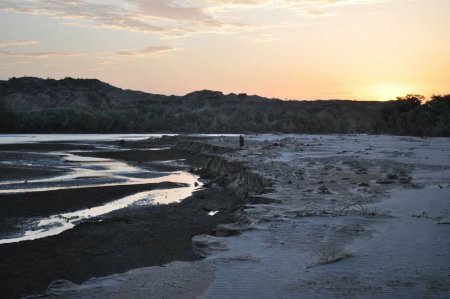 The Turkana Basin Institute has a facility on the eastern shore of Lake Turkana at the site of Ileret, famous for its fossil-rich sediments and discoveries that regularly make headlines. The TBI Ileret facility houses some of the National Museum of Kenya’s specimens recently collected from the area..
Sibiloi Park on the east side of Lake Turkana is home to many reebok, hippo, zebra, crocodiles and diverse flocks of birds. 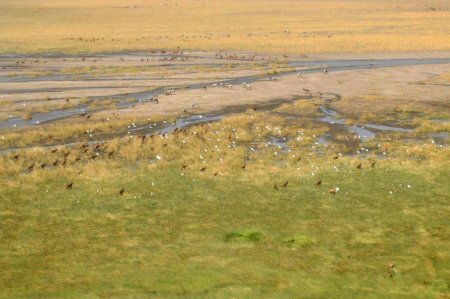 East Lake Turkana is lush in vegetation when compared to the west of the Lake, and now home to many more animals. Scientists and locals do say however that West Turkana was less arid even 100 years ago compared to today. Stormclouds forming northwest of TBI before rains in the afternoon. 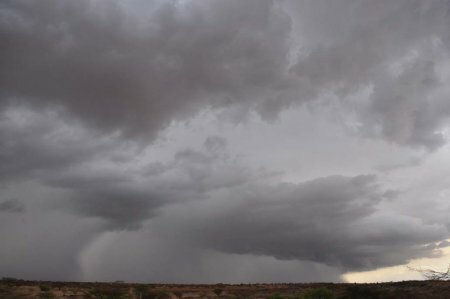 To everyone’s excitement, great storm clouds brough rains to much of the Turkana Basin last week. Debbie and Sonia stand with Francis as the rain approaches. Francis Emmekui is from Nariokotome, and one of TBI’s fossil hunters. He remembers excavations at Nariokotome outside his home as a child, and is much loved by students for this story and others that he relates when not busy supporting expeditions in the field. Alisha, Debbie, Mary and David enjoy tea in the shelter of the mess hall as it rains at TBI. 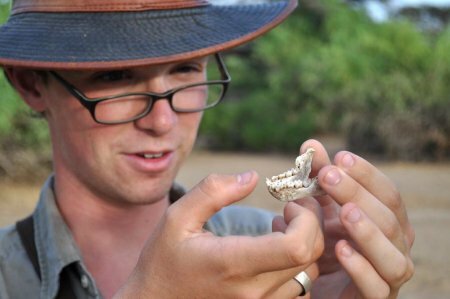 Ben finds a vervet mandible in the shrubland outside TBI's main camp. Vervet monkeys are sometimes seen in the riverine canopies adjacent to the Turkwel River at TBI. Their remains are collected and preserved as teaching and comparative zoological materials in the TBI labs. 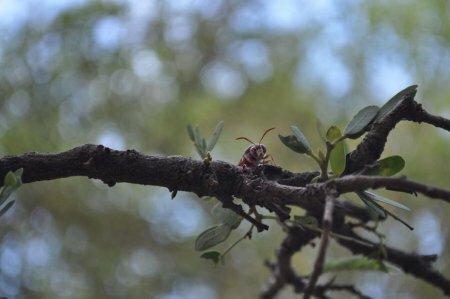 A wasp sits on a Tamarind tree branch as evening approaches. Sunset over the Turkwel river at TBI.